In the early days of stacker at Remind, the number of stacks that we were managing was just a handful. CloudFormation stacks were updated sequentially, without any parallelism, and everyone was happy. Today, stacker manages 153 CloudFormation stacks that build out all of the AWS infrastructure that makes remind.com work. As you can imagine, attempting to update 153 stacks without any parallelism takes a long time, about 10 minutes to be precise. When you consider that most stacks don’t ever change, 10 minutes feels like an eternity, and prevents a quick feedback loop. Over the last couple of weeks, I took it upon myself to refactor the core issues in stacker that made implementing parallelism difficult, and dropped our total execution time from 10 minutes, to under 1.5 minutes. This work is now included in stacker 1.2 so everyone can benefit. Before I dive into how we implemented parallelism in stacker, I think it’s important to take a step back, and look at what stacker is, at it’s core; a tool for linking infrastructure together as a dependency graph. Let’s take a look at a hypothetical stacker config to build out some infrastructure. When described in this way, the output lookup creates an explicit dependency relationship between stacks. 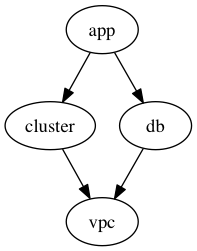 The “app” stack depends on a “db” stack and a “cluster” stack, the “db” stack depends on a “vpc” stack, etc. We can visualize the resulting dependency graph using dot. What does “app” depend on? A subset of graphs, called Directed Acyclic Graphs, also let us ensure that there are no “cyclic dependencies” present, a common case of poorly defined boundaries in software. There’s a lot of ways that you can think about CloudFormation and stacker (and similar projects, like Terraform), but I like to think of it as a tool that can build a “static binary” for a distributed system, and allows you to specify every dependency of that system as a Directed Acyclic Graph (DAG). Once we understand that we’re just working on a graph, it opens up opportunities to leverage Graph Theory research to improve performance. Upload a template to S3. Call DescribeStacks on the CloudFormation stack to determine what parameters are currently defined. Call UpdateStack to attempt an update using the (potentially) new template. If the new template produces an update, we start polling DescribeStacks until it’s done. Otherwise, the response from UpdateStack will let us know if there’s no updates required. With network latency (and AWS API performance), the minimum total time it takes to perform everything above, without taking into account the amount of time an actual update would take, is about 1-5 seconds per stack. But, if we look back at our graph, both the “cluster” and “db” stacks don’t depend on each other, which means they can theoretically be executed in parallel. In Graph Theory, this is referred to as the “critical chain”; the longest path from the top of the graph to the bottom. Execute “cluster” and “db” in parallel after “vpc” has completed. Execute “app” after “cluster” and “db” have completed. Which means our total execution would be 15 seconds (5 seconds * critical path). This algorithm is known as “parallel job scheduling”, and there’s a great paper from MIT on it. With MIT’s paper in hand (figuratively), we can implement a function that will walk the graph in O(N) time, where N is the critical chain, regardless of the total number of nodes in the graph. # successfully, or errored). Returns True if all nodes returned True. # nodes dependencies have executed. # Wait for all dependencies to complete. # Start up all of the threads. # Wait for all threads to complete executing. This omits certain caveats and details, like cancellation, limiting the maximum concurrency, and handling API throttling and retries. After swapping out the graph walker with the implementation above, stacker 1.2 can now build infrastructure significantly faster than before.